Since we brought J. Scott Catering on as one of our official partners, our clients have expressed gratitude for all the advice and personalized event ideas that its team of experts provides. So when one of their renowned professionals—Megan Freeman—so graciously offered to share her insight into corporate event menu planning, we were overjoyed. We are sure that her extensive experience and knowledge of industry trends will inspire your corporate event menu ideas. So, without further ado, we will hand it over to Megan! Your guests will arrive full of excitement, so offering appetizers will fuel their enthusiasm throughout your event. When it comes to appetizers, opting for seasonal, healthy hors d’oeuvres will give your guests a fresh taste and a sustainable energy source. Vegan and gluten-free items come with the added benefit of ensuring that all guests with specific dietary needs find something they can enjoy. Tip: If your event setup is designed to encourage mixing and mingling in various spaces and a dynamic event flow, then choose healthy appetizers that guests can grab and go. Seasonal Moscow mules and craft beers are incredibly popular, and the variety of flavors means you can offer your guests an assortment that matches your event style. 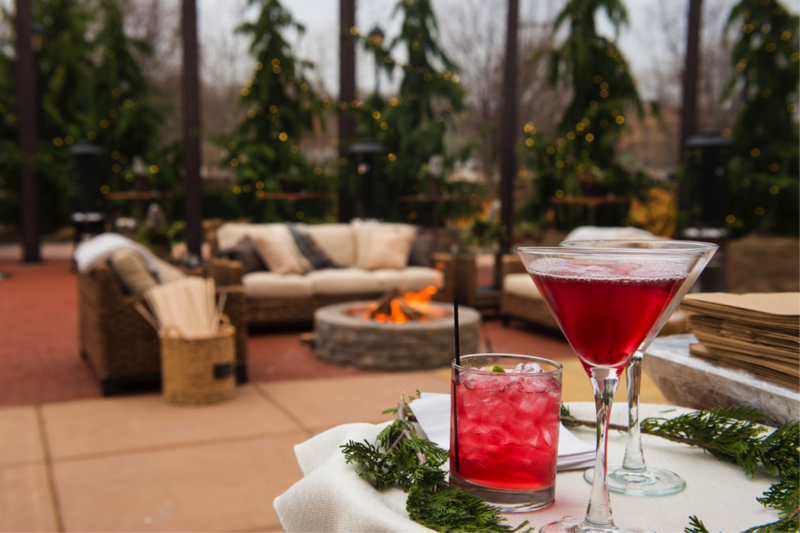 For example, an exemplary company holiday party that transformed the Phoenixville Foundry into a Colorado ski lodge featured a pomegranate Moscow mule. For summer events, we can’t help but imagine tastings among rustic décor and a farm-to-table menu. This dual entertainment and drink service is an efficient setup that immediately engages your guests and gets them mixing and mingling. 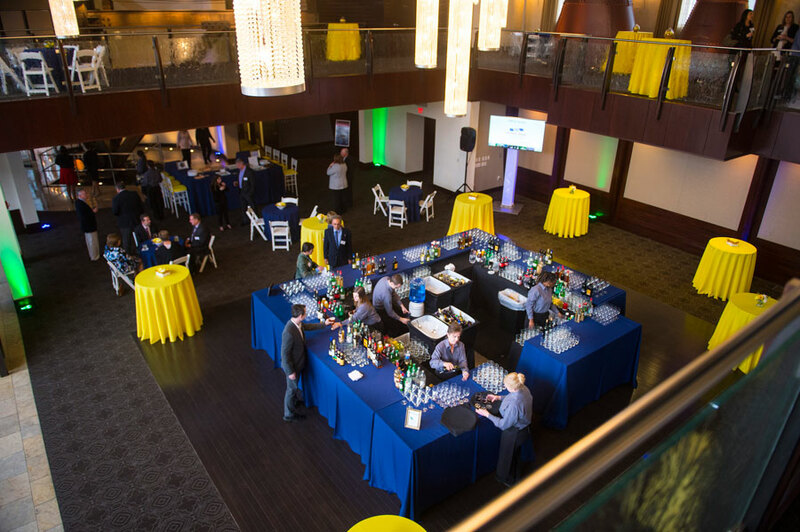 Just add some fresh herb accents like thyme and rosemary to other beautiful beverages and your event will lead the way in drink trends that reinforce the popular atmosphere that brings the outdoors in. Tip: Offering the ability to customize drinks—even if only in choice of garnishments—is a great way to encourage your guests to showcase their personalities. Sit-down dinners have given way to more dynamic and interactive food service. 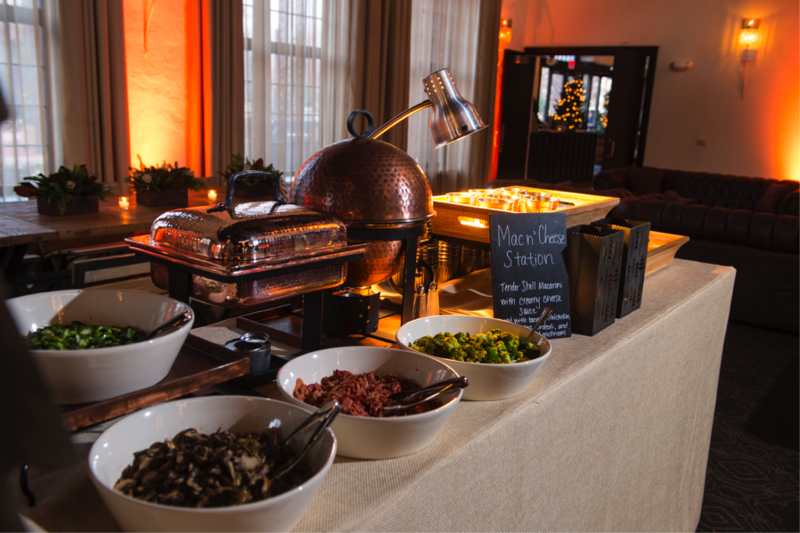 Food stations continue to gain in popularity, with carving stations and Italian stations being the go-to for fun and formal corporate events. However, more companies are asking us how to embrace diversity in their custom menu. And miniature vessels featuring different cuisines are the answer. As with all menu items, we love to feature sustainable, locally sourced ingredients that positively reflect upon your corporate values. When guests sit down to their tables, let them savor delicious food that makes a bold statement. With mixed seating being the new norm, some great conversations will follow! Tip: Ask your caterer to share a bit about their food or chefs on your menu signage. Your guests will have a deeper appreciation for the tasty food they enjoy. The first impression you impart on guests is always important, but so too is the last. So leave them with a warm and comforting message that you are grateful that they joined you today. Warm milk & cookies, freshly made doughnuts and mini cheesecakes are all easy to pick up and carry on with the conversation or walk with from your event. Tip: Whatever dessert matches your event style, be sure to wrap some up with your company logo so guests can take some to go as a reminder of the good times. If you’d like J. Scott Catering to custom design the menu for your Phoenixville Foundry event, contact their experts online or give them a call at 610.725.9420.